Start your review of Diana Miller. Send a message to Diana Miller. Thank You! 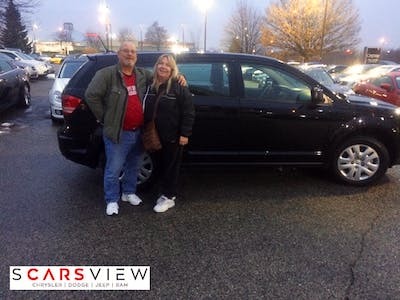 Your message has been sent to Diana Miller at Scarsview Chrysler Dodge Jeep. Had a great experience at the dealership. The salesperson was very knowledgeable, and went above and beyond to make us happy with the vehicle. My next purchase of a truck will be at this dealership. Thank you Mohammad! Very excellent service and very kind employees! Bala Gunabalasim helped us with everything we needed during the process of purchasing our car! Would definitely recommend this dealership if you are looking to purchase a new vehicle! "Company does not honour Chrysler warranty "
Company advised me to go to another dealership to get my rust proofing warranty. Followed up several times and got terrible customer service. I called in yesterday and when Diana heard my voice (we have had many interactions and she knew it was me) I immediately asked for an update on my rust proofing warranty. I was immediately Placed on hold and after 20 minutes, she returned only to hang up on me. It has been 5-6 months now and I have received zero from this company. She had sent me to a body shop to get my truck looked at for a quote. Months later she told me that I should have gone to another dealership instead. What kind of service is this? Why can’t a dealership support and honour a corporate warranty program. This location has issues and certainly this person and warranty program is suspect to say the least. I want answers! Thank you for getting my van in and out fast. Was able to stop in without an appointment. Always friendly and very helpful. Much appreciated!